The chicken courting ritual consists of a rooster offering food he finds to hens by clucking in a high pitch, as well as picking up and dropping the food. (This same behavior is also observed in mother hens when she is calling her chicks to food sources.) The male may also drag the wing opposite the hen on the ground, while circling her. As a female responds to his call, the rooster may mount her and proceed with the fertilization. A female will usually lay an egg every 25 hours. 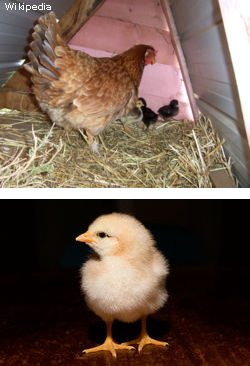 A broody hen will stop laying eggs and will instead sit fast on the nest and protect the nest and eggs she has laid. She will only get off the nest to eat, drink or dust bathe - and only for very short periods. During the brooding period, the female will keep the eggs at a constant temperature and humidity. She will also turn the eggs several times throughout day. This process is natural; hens will stand up three to five times a day and shift the eggs around with their beak. At the end of this so-called incubation period, which usually is about 21 days, the fertilized eggs will hatch. Since the eggs were all laid about one day apart, the chicks will also hatch about 1 day apart. The hen can hear the chicks peeping inside the eggs, and will gently cluck to encourage them to break out of their shells. Since individual eggs do not all hatch at exactly the same time (the chicken can only lay one egg approximately every 25 hours), the hen will usually stay on the nest for about two days after the first egg hatches. During this time, the newly hatched chicks will live off the egg yolk they absorbed just before hatching. Some breeds have been developed solely for the purpose of producing eggs and they rarely go broody, and they will often stop part-way through the incubation cycle. 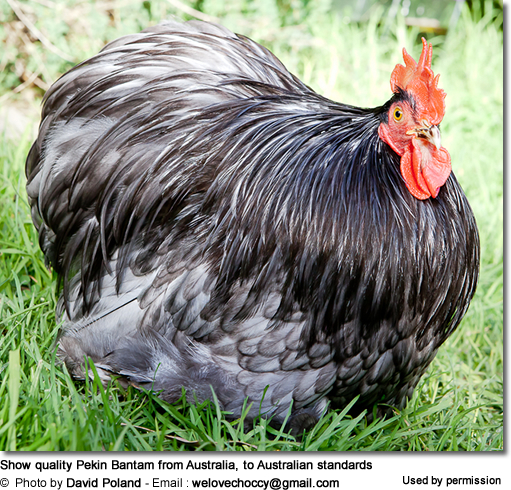 Other breeds, such as the Cochin, Cornish and Silkie, regularly go broody and make excellent mothers. In cases where natural incubation by the mother hen isn't possible, artificial incubation is an option. Many incubators are available, including industrial-sized with shelves holding hundreds or even thousands of eggs at a time, full temperature and humidity control, and automatic rotation of the eggs. Home incubators are also available (from basic to fully automatic) and hold a few to 50 eggs. Nearly all chicken eggs will hatch after 21 days of good conditions - 99.5° fahrenheit (37.5°C) and around 55% relative humidity (increase to 70% in the last three days of incubation to help soften egg shell). Bird eggs need to be turned three to five times each day, rotating at least 90 degrees. If they are not turned, the embryos inside will stick to the shell and may hatched with physical defects or - more likely - may not make it through the incubation process.